We’re still eagerly awaiting news of a sequel to Deus Ex: Human Revolution, the excellent prequel to the original Deus Ex. Until then we’re to have our hunger sated by a Director’s Cut of the game. The developers have gone through tweaking boss fights, updating the graphics, and adding new gubbins to the game. Eidos Montreal have released a video showing off their updates. The video’s keen to point out features brought to the game for the Wii U. I’m not too sure what devilry a Wii U is but it sounds dangerous. Stay clear of it fair reader. Besides that (Wii U)nholy object the commentary touches on a number of things the new release of Human Revolution will bring to the PC. Along with updated graphics and other visuals, like the new takedown animations, the feature that’s caught my attention is the eight hours of developer commentary hidden in the game. I love listening to creators talk about how they do their work and that alone is reason enough for me to pick up the Director’s Cut. 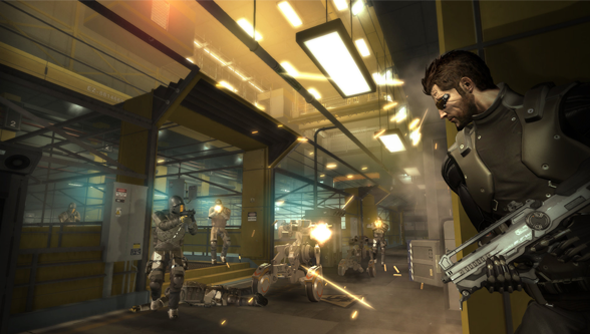 Deus Ex: Human Revolution Director’s Cut is due out on 25 October.